Are you looking for a B2B script? Then you are at right place to do. PHP scripts mall produces the PHP B2B script. This script is beneficial for buyers, sellers and traders to do their worldwide trade. The idea of B2B script is to establish a connecting bridge between the trustworthy vendor and potential purchaser. 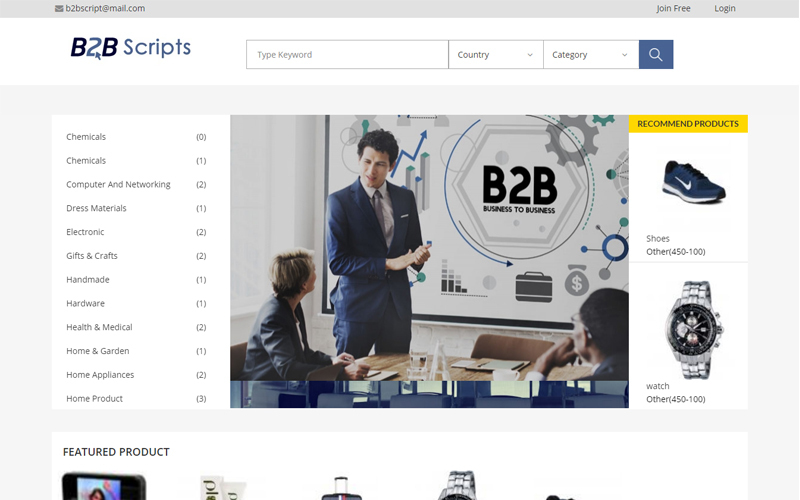 Open Source PHP B2B script is used to connect even the small and medium sized buyers and sellers across the world. The sellers can promote their products and the buyers can contact the seller through your website. You can start your own B2B website like alibaba.com, ec21.com, e800b2b.com etc in a short time with our B2B script. B2B directory listing software is developed based on PHP and MySQL programming languages. With numerous functionalities our developers designed this website. The script has a refined front-end design which can be redesigned. Through admin you can customize the categories, sub-categories, email ids, logos and necessary information’s. We offer the clients with best solutions and made the website customer-centric. Our script is enhanced with Google ads and banner ads to make good revenue. This PHP B2B script can be installed without any difficulty because our backend development team will help you all through the way. The script enhances multilingual support, easy go navigations and highly secure codes. Nowadays everyone prefers easy mode of payments through electronics so we have an in-built payment gateway. We know that getting your website to the buyers and sellers is necessary which is why we have made our script to be SEO-friendly by optimizing it in accordance Google standards. So your website will be on top of the hit list from the search engine always. Great Script and behind a great team support I just love it! thank you so much. I feel happy to purchase this script. The script was effective and affordable. The technical side was unmatchable. The offers provided by the company were very nice. I would highly recommend others also to go ahead with the script. This Script is absolutely fantastic but the main reason for my rating is customer support which is unparalleled. Not only are they quick to reply but also go the extra mile when they can and help you with things clearly outside of the support.